Help Jack rule primitive tribes after his time travel to the past in this marvelous mix of adventure and management! If you like this free game, try Legends of Atlantis: Exodus. Jack was at the fun park having the time of his life, but little did he know that the next ride would thrust him into the adventure of a lifetime. Through some strange occurrence, he was sent back in time and landed on a primal isle where the natives declared him their leader. Now he must help them build shelters, forage for food, turn back enemies, and mix drinks! Join Jack on this island that time forgot and help him lead the natives while searching for a way back. Guide the tribe to construct useful buildings, collect needed resources, and decorate the landscape. They will then reward you with tributes and helpful items to make it through. 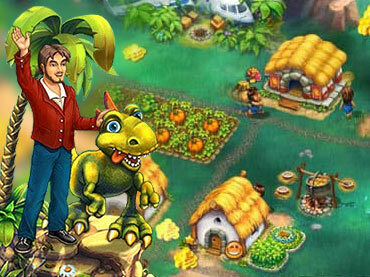 Introduce new technologies, play fun Hidden Object mini-games, and earn fantastic rewards. Free Game features: - Incredible journey to the Stone Age; - Rule a primitive tribe; - Collect Hidden Objects to resolve time paradox; - Meet chieftains and shamans; - Help Jack return home to the future. If you have questions about Jack of All Tribes game, please contact us using this form.